In the summer of 1885 Charles Chamberlain Hoyt and his family drove in a 2-seated carryall from Greenfield, Massachusetts to Ogunquit looking for a place by the seashore to build a summer home. He purchased from Israel Littlefield the field extending from Israel Head Road to the present Anchorage property along Shore Road, and from the ocean to the Marginal Way access path that goes along the back side of the Inn. The family used a tent for a few years, picnicking on the site before building the large Victorian summer cottage that he named “Beachmere.” He also built three cottages that still exist on Beachmere Lane and another cottage on the present Colonial Inn property, one for his sister Annie Hoyt, (Blue Shutters), one for his ex-wife, and one for his secretary, so the story goes. He built a large barn for his horses with a spring fed watering trough inside. This was later demolished when the South building was constructed. A five-story viewing tower with windows on all sides was built in the early 1900s and torn down in the ‘30s. His two daughters later built houses for their families on Ontio Way behind the Beachmere. His brother E. R. Hoyt also bought land in Ogunquit along the river and built his house called Fieldstone, now turned into condominium units. Their father Joseph Gibson Hoyt taught at Exeter Academy, where Hoyt Hall is named for him. Later he became the first chancellor of Washington University in St. Louis. His two sons, C. C. and E. R. formed the Hoyt Metal Company, making lead organ pipes among other products. The company was later sold to National Lead Company. After C. C. Hoyt died in the early 1930s, Beachmere was leased by his estate to a Mrs. Johnson who operated the property as The Blue Heron Tea Room and rented four upstairs guest rooms for several years. The tea porch was quite popular. For one year only, the “dry” town of Ogunquit voted to allow the issuance of liquor licenses. That single summer she opened a cellar cocktail lounge called Raggedy Andy’s. Unit 8 is on that site today. 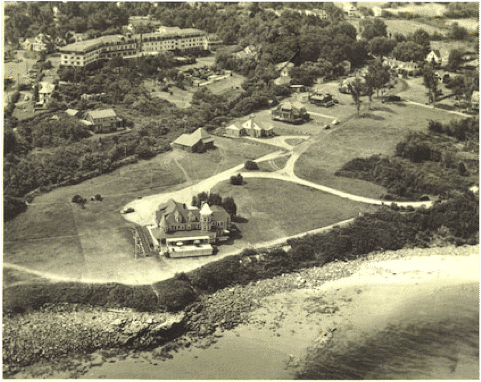 In 1937, Beachmere was purchased by Ann and Malcolm Merrill from the Hoyt Estate and named “Beachmere Inn.” Initially the room rate was $5.00 per night per person which included three meals a day. During WWII, the U.S. Coast Guard took over Beachmere Inn to house the men patrolling the Marginal Way looking for German submarines. These two very cold winters were the first time this summer-constructed building was heated year round. It is a tribute to my grandfather that they survived the cold, were fed, and that the building stood. 1958 was the last season the dining room operated. Kitchenettes were then added to the rooms. The next major renovation was the construction of the South Building, in two stages – 1962 and 1966. The three hill cottages came into the Inn operation in 1984. Hearthstone was my grandparents’ summer home. The Presbyterian Church of Philadelphia built Hearthstone in 1929. My mother grew up there and is thrilled it is still in the family. Mayfair, built in 1899 by the Stehlins, was bought by our family in 1964. The house was expanded with the Studio and Garden Suite units added. It is where my mother lives now. Bullfrog, named because there were bullfrogs in the basement, was purchased in 1964 and was originally a summer cottage. In 2008, our new West building was completed, adding 16 king-bedded suites, function space, our hot tub and sauna, massage facilities, exercise and play rooms and our Pub. Some 750,000 guests have come to The Beachmere. A few noteworthy ones, performing at The Ogunquit Playhouse were Beatrice Lilly (Lady Peel), Ethel and Diana Barrymore, Bette Davis and her mother. Ambassador John Cabot Lodge and Vice President Richard Nixon were guests. The Nixon family stayed in Hearthstone for a month. Related to the Hoyt family, five generations of the Head family have vacationed here over the years. Many families tell us the location of rooms their parents have stayed in. Three generations of one family have honeymooned in the same room. Our commitment to this area of Ogunquit has deep roots. The Merrill’s hold the distinction of being hoteliers for the longest period of time in Ogunquit. Coming from Scarborough, Maine in 1899 my great grandfather Oliver Merrill and Frank Knight formed a partnership to build and operate the Ontio Hotel. In 1907 my grandfather Harry L. Merrill purchased a small boarding house, The Lookout Hotel, also on top of Israel’s Head. He and my grandmother Harriet Merrill worked together operating the hotel for the very short season that began the end of June and ended on Labor Day. Guests would come for the whole season. In the fall they would drive to Winter Haven, Florida where they owned the Florence Villa Hotel until the military bought it for an airbase in 1941. After the depression Harry Merrill and my father Malcolm Merrill expanded the Lookout to its present size. 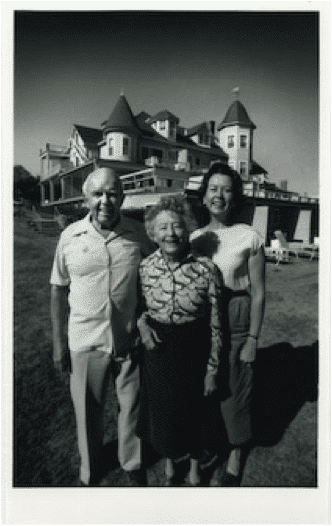 In 1937, Beachmere Inn was added for my mother Ann Merrill, to operate. My first husband, Martin Mace and I bought the Lookout and Ontio Hotels in 1964 and 1972. We operated them together until he died. The Lookout was sold in 1977 and The Ontio in 1984 and now are condominiums. In 1986, I purchased the Beachmere from my parents. In 1995 my daughter, Sarah Mace Diment, joined the business. We formed a family limited partnership to ensure the property stays in the family. We are all from Maine with the exception of my mother who was from Iowa and my husband, Don Gillespie from Ohio. Don, a Boston architect who passed in 2014, had designed many complicated renovations and upgrades in all the buildings. In 2002 Sarah took over as General Manager and thus continues the tradition, now helping us celebrate our 76th season of family hospitality in Ogunquit, Maine. 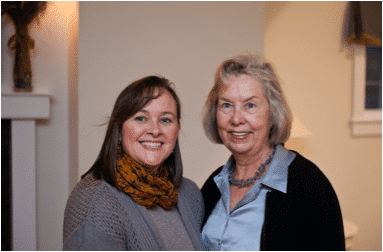 In 2013 Sarah was honored with Maine Innkeeper of the year, we are all so proud of her and her team!